If all is going as planned I'm now in Savannah, the weather is beautiful and the scenery stunning. I'm actually writing this blog post before I leave since I didn't bring along my laptop and won't be posting while I'm away. Tonight I'm going to be having dinner at The Lady & Sons restaurant which is Paula Deen's place. I understand that it buffet-style so I'll be able to indulge in all kinds of Southern cooking, especially the stuff that's bad for you! 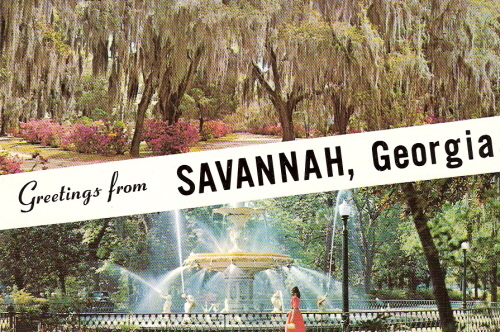 Have a wonderful time -- I've always wanted to go to Georgia -- some day I'll get there. In the meantime, please enjoy it for me! It was great meeting you today, and the Savannah weather sure did it's best to show you some warm sunshine! I love your writing! Oh wow, I can't wait to hear about your trip (and the restaurant). I haven't made it to Georgia yet, but it is somewhere that I'd love to go.